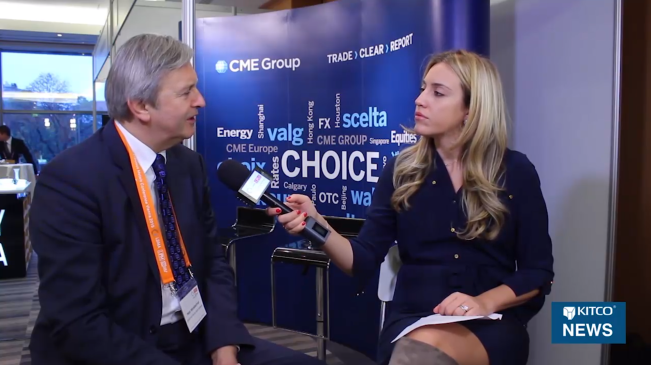 Sprott Money News (SMN): Hi, welcome back to this week’s Ask the Expert. 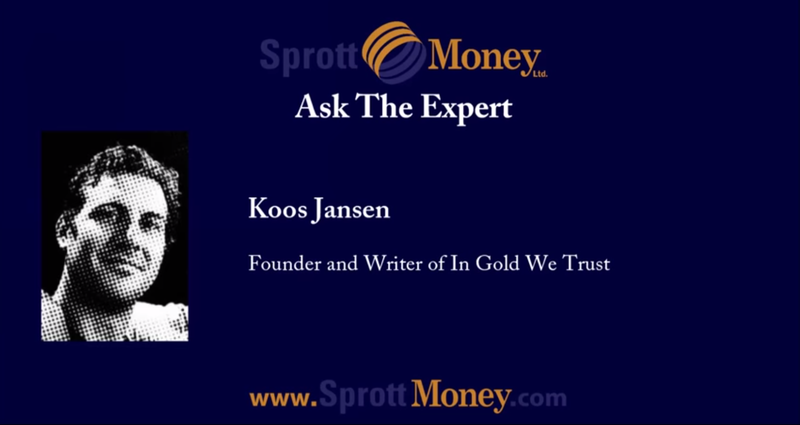 I’m Geoff Rutherford for Sprott Money News, and on the line with me today, we have Koos Jansen of In Gold We Trust. Koos is the founder and writer of In Gold We Trust. 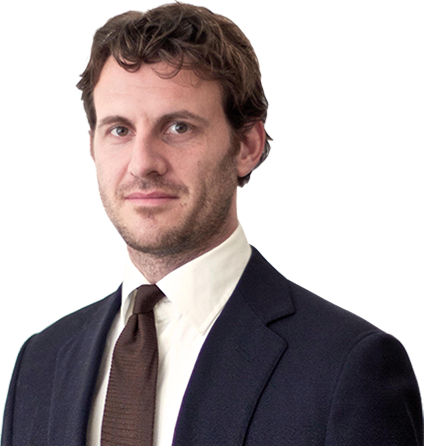 He launched his website in 2013, after discovering discrepancies in reporting between the amounts of physical gold being withdrawn from the Shanghai Gold Exchange. The website is now dedicated to Koos’ research, and his website is read and followed by many industry experts around the globe. Koos is also a consultant for GATA; and with that, I’d like to welcome Koos Jansen. Good day, Koos. How are you doing today? Koos Jansen: I’m good. Thanks for asking me, Geoff. SMN: Wonderful, wonderful. Koos, to let you know, we had a little bit of a talk before, but I didn’t mention this. You’re actually very highly regarded by our Chairman, Mr. Eric Sprott. He actually has recommended you to our listeners before, so I’m really, really happy to have you with us today. Koos Jansen: Yeah, I heard that show in which he recommended me. I actually had a phone call with him a few weeks after that. He told me my site is in his bookmarks, and I was really chuffed. SMN: Excellent, excellent. Wonderful, Koos. So, Koos, you started your blog, In Gold We Trust, back in 2013. 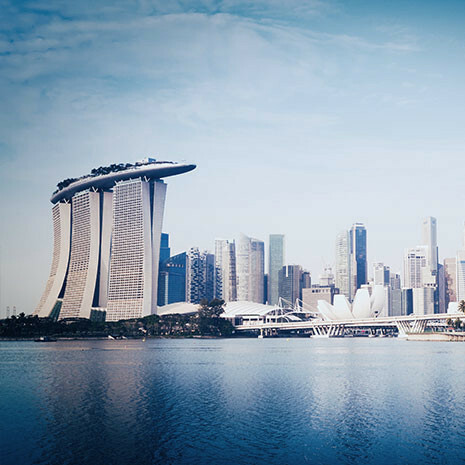 Within such a short time, you’ve garnered the attention of investors and industry experts alike. Before we get started, can you let our listeners know your interest in gold, specifically the Chinese gold market, and how all of this came about? Koos Jansen: It came about after Lehman fell. In that time, in 2008, I wasn’t aware of economics. I always had this passion for economics but I had another profession a couple of years ago so I wasn’t doing anything with it. But, after Lehman fell, I could really see, and the crash came a bit later in the Netherlands. In 2009, I could really see the depression and the recession going on here. People were losing their jobs, becoming depressed. And then, I started to pick up some books because I became interested in how is it a carpenter doing a great job suddenly don’t have any jobs anymore? Just basic questions popped to mind and so, I started reading and I started reading blogs. I think my advantage is that I didn’t study economics so I could develop my own ideas. I could pick up my own books, my own blogs, really develop my own thoughts, instead of a teacher telling me about Keynes and about the way it is. I developed my own thoughts and so, that’s how I became interested in gold and economics in 2009, 2010. This developed and developed, and I started writing Dutch articles for small blogs here; and then in 2013, I found out about the Shanghai Gold Exchange. In the beginning of 2013, there was not, that I was aware of — there was nobody in the English-speaking world or in the West, writing about the Shanghai Gold Exchange. So, when I found out about the Shanghai Gold Exchange I thought, “Whoa, this is a story. This is something.” I was helped by a few Chinese people. I met one Chinese guy on Twitter and then I reached out to Chinese people on blogs. I got this knowledge base or source base from Chinese people in the mainland — goldbugs, investors, really smart people. And I started to dig and I found out about, not only the Shanghai Gold Exchange, how much gold is being withdrawn from the vaults, et cetera, but also about the structure of the Chinese gold markets. The funny thing is that I was using a lot of translation software to read the Chinese media because the Chinese, what they write in English is just what they want us to believe, but if you read everything in Chinese, it’s a completely different story. I read it through the translation software but if I think it’s something interesting, I let my friends in China translate it for me so I have proper evidence, because the software isn’t accurate. SMN: Great. It’s interesting, it is. So, essentially, what you’re saying is that you kind of got the inside scoop from people within the country. That being said, I mean, when you look at it from that perspective, you release information that’s not readily available to the rest of the Western media and the audiences. Your figures differ by wide margins compared to what is often recorded officially. So, where do you get your data and how reliable do you believe it is? Koos Jansen: I get it from Chinese media. For instance, the Shanghai Gold Exchange has two websites. It has an English website and it has a Chinese website. My data is predominantly from the Chinese website because all the interesting data about the withdrawals from the vaults, for instance, is only published on the Chinese website. On the English website, you get some volume trades; you get deliveries, which is something else. I would like to make the emphasis on this; deliveries is something else as withdrawals from the Shanghai Gold Exchange. So, I get my information from Chinese websites, Chinese website from the Shanghai Gold Exchange, also, Chinese media; and a lot of all these, which I just talked about, all these Chinese people who are helping me in the mainland, are sending me reports. For instance, you can go to the Shanghai Gold Exchange website, the English one, and you can see a few reports, the China Gold Market Report 2011, 2010. But, there are a lot more reports that are not online anymore but I’m in possession of these reports because they are being sent to me. Some of them are in Chinese, so it’s really hard to read them. So, that’s where I get all my data from, and it’s kind of tough to put all things together, but I did, and I came up with my own analysis and nobody is able to debunk my analysis, I think. I really asked people on Twitter and other professionals, “Please debunk my analysis or try to say something which proves me wrong,” but it’s an all-in analysis and I think it’s strong. SMN: So, Koos, why do you think there’s such a discrepancy between what we actually see in the West as far as gold demand is concerned as compared to what’s actually happening in China? Koos Jansen: I think, the main reason is that China is really secretive about their gold accumulation. You know they have a lot of dollars in foreign exchange reserves. This is a real problem because they know the US made a mess of their budget and everybody wants to get rid of their dollars. They have far too much dollars in foreign exchange reserves so they want to convert these dollars into gold, not only the government, but they also want to stimulate their people to accumulate a lot of gold. But, they don’t want to affect the market too much so they want to do this secretly. A few obvious clues for this are, they don’t report on official imports, the numbers. 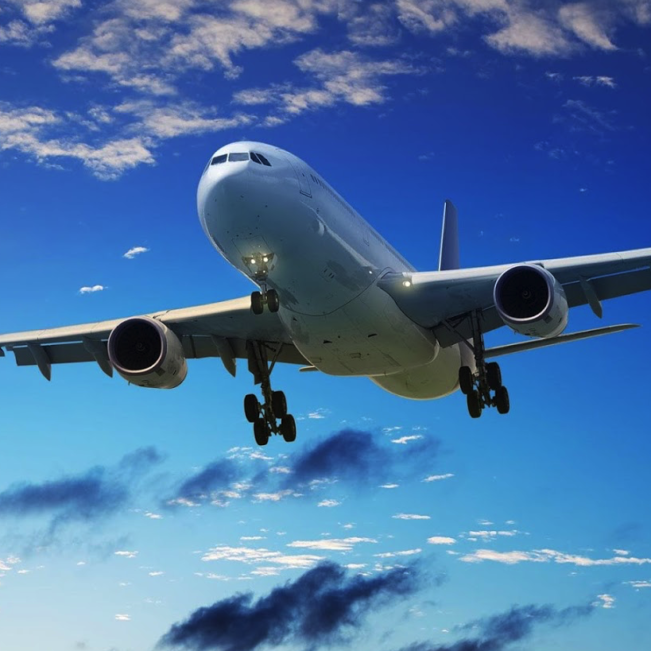 We only know the official numbers from Hong Kong export to the mainland. They also don’t — they’re really silent on updating their official gold reserves at the People’s Bank of China. All in all, they want us to believe their gold amount isn’t that much, the China gold, and it’s obvious. According to my analysis before 2007 or 2008, they were quite honest about gold amounts; and after 2008, they started lying a little bit about certain numbers to hide the demand. The China Gold Association, their official numbers are more or less the same as the World Gold Council, which if we talk about 2013, Chinese gold demand, they claim, is 1100 tons, more or less. That’s what they want us to believe. 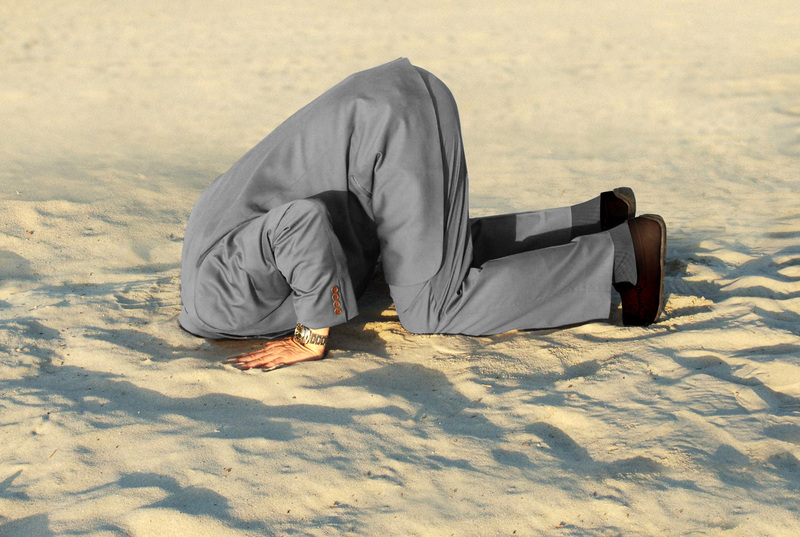 SMN: So, Koos, all these reports showing that Chinese gold demand is declining, are we saying that the numbers are inaccurate, are the numbers skewed? What’s your take on that? Koos Jansen: In 2013, the Chinese gold demand was huge; and also, in the beginning of 2014, it was huge. So like I just said, the World Gold Council said it was 1100 tons, the demand in 2013. I say, it was at least 2200 tons, excluding People’s Bank of China’s demands. The demand is dropping at the moment. In the last six weeks, from looking at the withdrawals from the Shanghai Gold Exchange, which is my primary benchmark for Chinese demands, I can see it dropping right now, which isn’t so significant because they had an immense, really extreme start at the beginning of 2014. And from those extreme levels, it’s going to just high levels. Like in the beginning of 2014, weekly withdrawals from the Shanghai Gold Exchange vaults, which is Chinese demand, was sometimes 60 or 70 tons, which transcends global mining production. And now, it’s 30, 40. Last report came out, it was 25, I believe, so it came from very strong to less strong. SMN: Right, right. So you’ve mentioned, actually, before, on your blog, that China may be releasing its updated holdings, either this year or the next. Once they do, Koos, do you believe it will have an impact on the gold price globally? Koos Jansen: Yeah, I think I do. Because if the world’s second largest economy, which is China, releases, and I think everybody knows or at least I assume, when they come out, it will be something around 4000 or 5000 tons. And this is because me, and a lot of other analysts, look at the gold-to-GDP ratio; we don’t look at foreign exchange ratios but at gold-to-GDP ratios. Having said that, they’ll probably come out when they have enough. According to this gold-to-GDP ratio, they need to be on par with the United States, so they need to have 4500 tons in official reserves. When they have it they will announce it. I’m not saying, like Jim Rickards said, they will come out every six years. I just think that when they have 4500 tons, they will announce it. It will have a major impact on the price of gold, I think, because if the second largest economy in the world is saying, “We attach a lot of value to gold reserves and we’re going to continue accumulating and this is going to be the cornerstone of our capitalism.” Of course, it’s going to have a big impact on the price of gold and on the global monetary system. SMN: Thank you, Koos. So, China is pushing its people to buy and invest in gold. What benefit does this have for the Chinese government? Koos Jansen: It’s to strengthen the Chinese economy, as a whole. The reasons for the citizens to buy gold are the same as for the People’s Bank of China to buy gold. It’s to protect your reserves from internal and external shocks and inflation, and it’s the cornerstone of capitalism. And, you see the Chinese government not only stimulating its people to buy gold but also, discouraging them from buying stocks and real estate. Ironically, the Chinese government is aware of the sensitivity of owning reserves that can be controlled by government, so they know this and by this, they are promoting their people to invest in gold in a big way. If you look at the Chinese media, they’re running ads on state television; they’re showing items in just normal news broadcasting shows, they’re showing items about gold vaults, and every Chinese citizen is aware of gold and of the importance of gold, I should say. SMN: Right. So, looking at that, I mean, again, over the last month, months, for that matter, with another program we have called Weekly Wrap-Up, we talk to different industry experts, usually Eric Sprott and likewise, Rick Rule; but one of the discussions that we’ve had with Eric, consistently, is the idea of gold manipulation. Manipulation by Western central banks in the gold price has been widespread. We know this because we’ve seen lawsuits, there’s been a number of articles about it, I mean, it’s there. So, that being said, do you believe that China has a role in this manipulation? Koos Jansen: Yeah, I do think so, yeah. What I think is that the gold price at this moment is being manipulated in the Western markets but in conjunction between, let’s say, the West and the East or the United States and China. The United States and China are sort of in a marriage. It’s becoming a bad marriage but they can’t really live without each other at the moment. Maybe, they want a divorce in the future, but those things take time, certainly, when it comes to economics. A couple of years ago, the marriage was — China exports a lot of goods towards the United States; dollars were being sent back and China bought U.S. treasuries with those dollars. Now, the situation is that, since the crisis, the U.S. made a mess of their budget and they need to devalue their dollars and China has all these dollars in foreign exchange reserves. And, if the dollar will be devalued, China will see its reserves evaporate. But, China holds a lot of cards in its hands and it has some power over the US. Effectively, it can control the value of the US dollar. So, these people probably talk on the phone about gold every day and I think, the agreement is — what happened in 2013, in April, is that in Western gold markets, the price of gold was forced down and this allowed China to accumulate gold, which has obviously happened. I can not only show it by the SGE numbers but also, I analyzed all the customs data from the UK, Switzerland, Hong Kong, and so forth. 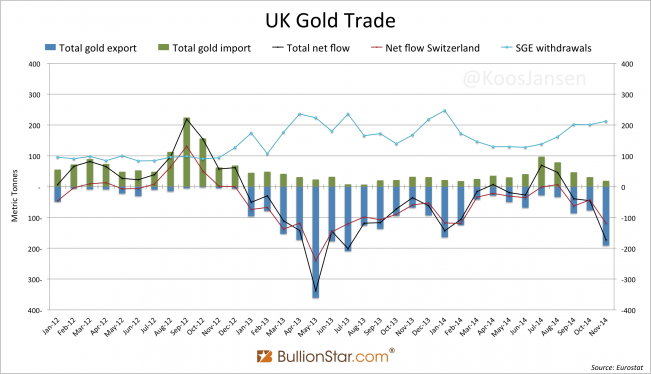 You see all this gold from the West, mainly from the UK, going from the UK through Switzerland. It’s being refined in Switzerland into 1 Kg .9999 bars — from Switzerland to Hong Kong and from Hong Kong to Shanghai. At the moment, you see not only the power moving from West to East, you see not only the dollar crumbling, but you can really see the physical gold is moving towards the East. I think, it’s a cooperation between the West and the East to manipulate the price of gold at this moment and I think, it will be in the interest of both. If China has accumulated enough gold, it’s in the interest of both to let the price of gold to slowly rise. SMN: Now Koos, tying in one of your recent articles, you mentioned that China will be implementing a deposit insurance system in the event that financial markets default. Now, given the West’s current status with gold, how do you see the Western markets responding to this said market default? Koos Jansen: Well, I think in the West, we chose, or we — because I live in the West, we chose for the bail-in option after Cyprus. That was the first bail-in event; and after that, a lot of Western governments made these bail-in laws strangely because when this happened, I read it as a sort of a hint for the Western people to also buy gold. Seek safety, get your money or think about your financial health, take responsibility, buy some gold. SMN: There you go. Oddly enough, my next question to you was, what would you recommend as the best course of action against experiencing major financial losses? But, essentially, that’s what you’re saying, is to buy gold. Koos Jansen: Yeah, buy gold. I have most faith in gold not only because all central banks in the world hold gold, and the Chinese government. If you look at the Chinese gold market, and China’s really going to be leading in this because it will be, I think, in a couple of years or in 10 or 20 years, it will be more powerful than the US. So, the Chinese are leading in this. They chose gold as the cornerstone of their capitalism, like all the laws in China for accumulating gold. No, I should say, “Definitely.” All the laws they have for the Shanghai Gold Exchange and all imported gold must be sold through the Shanghai Gold Exchange, and all mined gold must be sold through the Shanghai Gold Exchange. This whole structure of the Chinese gold market tells me they have chosen gold, obviously, because they also have gold as official reserves at the People’s Bank of China, not silver. 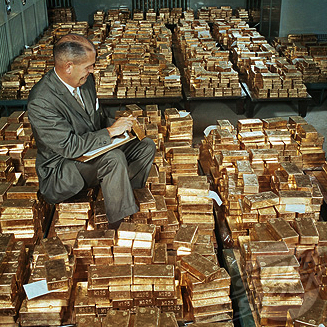 They chose gold as a part of their future monetary system. That’s why, I’m more of a gold bug than a silver bug; but, needless to say, if gold goes up, silver will follow. But I would say, protect yourself and buy some gold. SMN: Excellent. Now, Koos, I know you said before that you’re not a forecaster, so I can fully appreciate that. But looking from a bird’s eye view to the future, anyways, you’ve written that China’s gold demand for 2014 has been huge but has recently slowed down, although it still remains very robust. 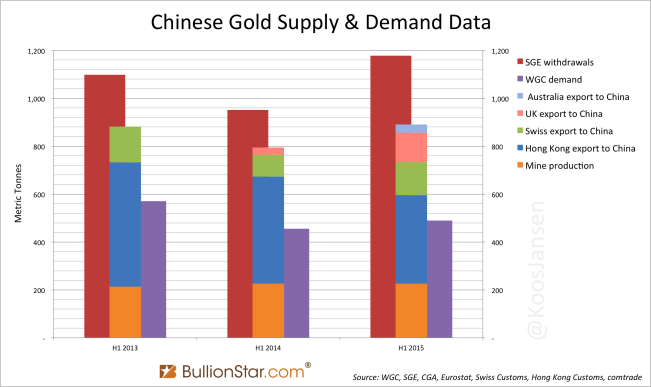 What do you see China’s gold demand being for the remainder of 2014? How do you think a slowing Chinese economy and their shadow banking will impact the gold demand? 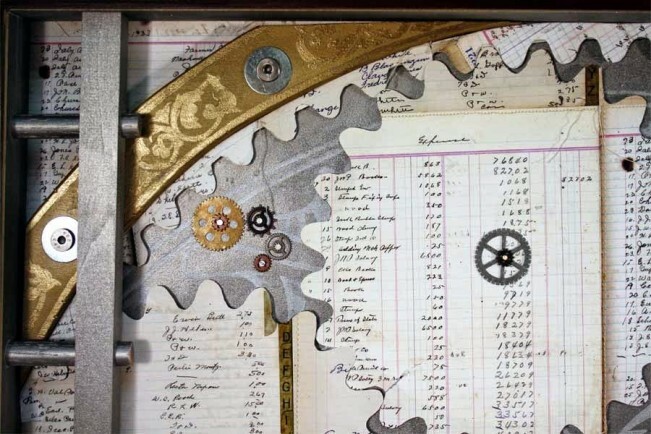 Koos Jansen: I don’t think a slowing economy necessarily means less demand for gold. Like I just said, if a bank fails, demand for gold rises. I don’t think, in 2014, demand will be as high as in 2013 because it was a really special year. And, looking at the numbers now, I don’t see these peaks that happened in 2013 happening in 2014. So, it will be less than in 2013. In 2013, it was 2200 tons. I think, it will be about 1800 tons non-government demand for physical gold in China. SMN: Okay. Thank you for the forecast. Well, Koos, I’d really like to thank you for joining us today. We really appreciate your thoughts and your insights, and hopefully, we can do this again in the future. Koos Jansen: Yeah, I hope so. SMN: Wonderful. So, Koos, thank you again for joining us. To our listeners, be sure to check out Koos’ blog, In Gold We Trust; and likewise, visit sprottmoney.com as well, for any other information. For Sprott Money News, I’m Geoff Rutherford. Thank you for listening to this week’s Ask The Expert. Have a great day.